A lot of diseases we see nowadays are triggered by inflammation which manifests as pain in different areas of the body. The majority of inflammatory-related diseases begin in the gut with an autoimmune reaction which progresses into systematic inflammation. Addressing the root cause of inflammation through diet instead of relying on medical "band-aids" for temporary relief is the best way to help heal the body from the inside out! If you suffer from inflammatory-related pain caused by bruising, swelling, wound healing, cramps and spinal pain or through conditions like arthritis, gout, fibromyalgia, carpal tunnel syndrome and cancer, drinking this smoothie can help relieve your symptoms. It is important to note that removing foods that trigger the inflammatory response (animal products, highly processed foods, refined sugar, table salt and wheat) will help speed up your recovery, especially when supplemented with foods that are highly anti-inflammatory (such as those featured in this smoothie!). 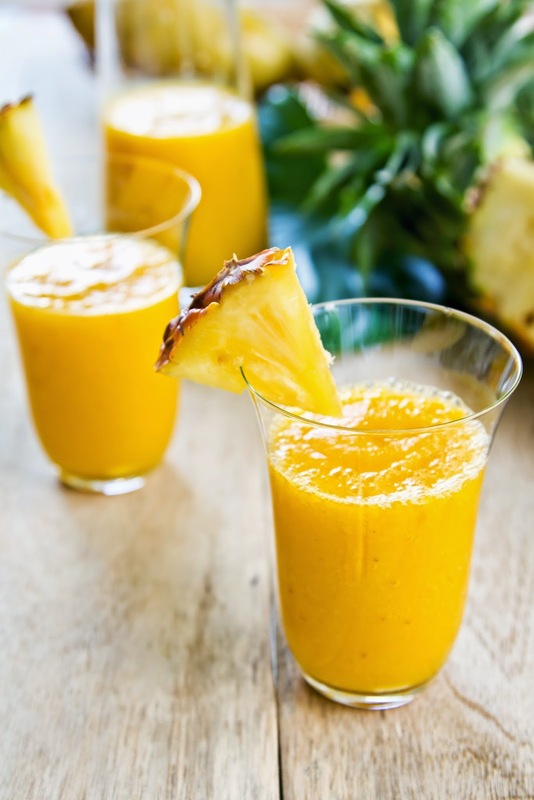 Pineapple contains bromelain and this enzyme has been shown to be extremely effective in reducing pro-inflammatory lymphocytes like CD4 T, primary effectors involved in inflammation in the body. Turmeric and ginger are also two powerful anti-inflammatory roots that have been studied extensively for their pain-relieving properties. Drink up & heal! Put the above ingredients into a high-speed blender like the Vitamix and pulse-blend for 30 seconds. Enjoy immediately and receive immediate pain-relieving benefits!